Silas Hatch of Durango works his magic off a jump during the slopestyle competition at the Burton Snowboarding U.S. Open in Statton, Vt., recently. Durango snowboarder Silas Hatch is still soaring.Hatch, now an honors student at the Colorado School of Mines in Golden, earned a coveted berth in the prestigious Burton Snowboarding U.S. Open recently at Stratton, Vt.
Hatch advanced all the way to the slopestyle finals at the U.S. Open, surviving the elimination of more than 180 riders. He eventually finished 35th in his first test at the U.S. Open, one of the premier boarding events of the year. 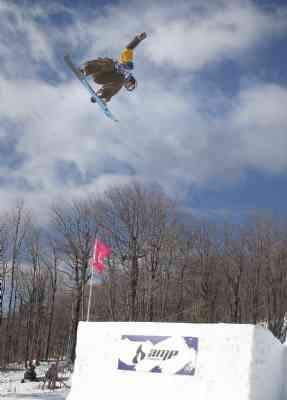 The Durango rider, who won a national title in slopestyle in 2005 at Copper Mountain, battled tough snow conditions in Vermont but still fared well, according to his coach, Josh Lingelbach, known as Muzzy in the snowboarding world. "Silas has come a long way," said Muzzy, who has coached Hatch for six years. Muzzy operates as an independent snowboarding coach (sanjuanfreestyle.com). "Look out for Silas ... next year," he said. Hatch trains at Breckenridge, Keystone and at Durango Mountain Resort. He is sponsored by Burton Snowboards, Smith, Pow Gloves, DMR, Inferno Snowboards and sanjuanfreestyle.com. NBC is planning television programming from the U.S. Open on upcoming weekends. Schedules vary by region. Video footage of Hatch also has been posted on YouTube. Another rider coached by Muzzy, New Zealander Shelly Gotlieb, rode to a fifth place at the U.S. Open in Vermont. Despite taking a bad fall, she still advanced to a fifth overall. She highlighted her slopestyle routine with a back flip off the top jump. "Shelly worked very hard all week to get her run, and after a bad fall came back to do her best," Muzzy said. Other riders on the San Juan Freestyle Team are Nate Chismar, Joe Reed and Matt Norton.